We accepted a generous invitation from Kelly at Martin Randall Travel to hear English author, garden historian and designer Caroline Holmes, talk about her latest book “Impressionists in their Gardens”. It was a great morning with beautiful music accompanying Caroline’s observations on the paintings, transporting us to summer days with colour-filled gardens. Caroline set a a cracking pace presenting talks in Australia and New Zealand, for ADFAS and Martin Randall Travel clients, but took time out to chat with us about her book, her adventures, and views on Our Australian Gardens. Impressionists in their Gardens is a delight for art and garden lovers with beautiful colour plates providing colour palettes for gardeners and bringing gardens to life. Many of the images feature people relaxing outdoors in beautiful surrounds. With spring upon us here in the southern hemisphere, we’ll soon be following suit – after we’ve done the work to get that result of course! 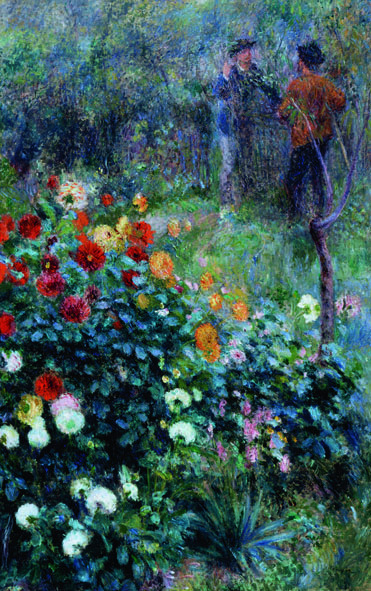 The exuberant, lush colour in gardens of European and American Impressionists provides a distinct contrast to the subtle, muted tones of Australian Impressionists, notably the Heidelberg School. Caroline uses a Charles Conder (1868-1884) painting Summer Idyll on the endpapers of the book which suggests the hazy colour and light of summer. 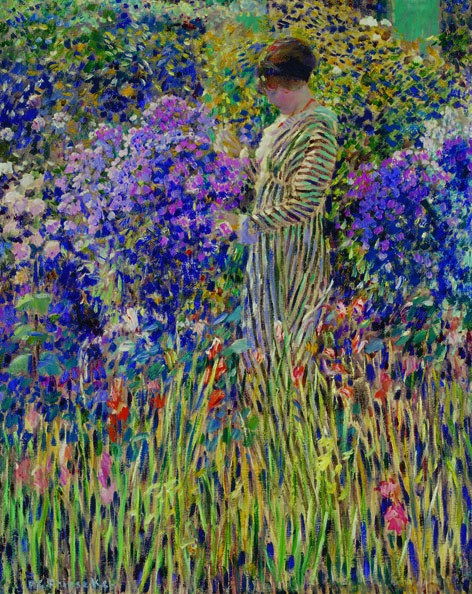 A riot of colour in a corner of the artist’s garden includes purple hydrangeas and splashes of red gladioli in the foreground, which emphasize the dress. 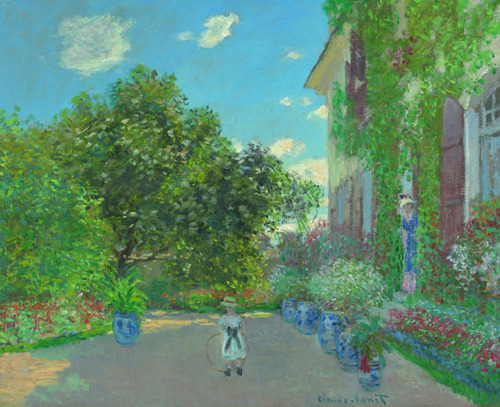 European Impressionists Renoir, Monet Manet and Caillebotte were all gardening before 1874. P53 – Claude Monet. Le Printemps (springtime). Oil on canvas, 1886. 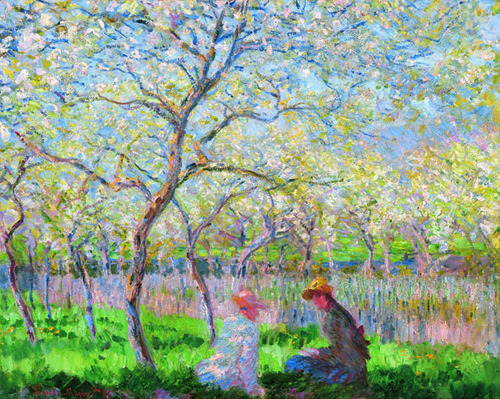 Monet’s apple orchard in Giverney is filled with blossom, and exudes light and life. Just as popular today, these blue and white pots went with Monet when he moved to Giverny. Caroline’s busy schedule includes lecturing at Cambridge University Institute of Continuing Education and in 2013 she’ll be guiding tours of the Grampian Gardens, and Chateaux of the Loire and Brittany. We look forward to her next book (when does she find the time?) and hope it’s not too long between visits to Australia. We’ll bring you more on Caroline’s observations about Frederick McCubbin’s Fontainebleau, in Mount Macedon, Victoria shortly. 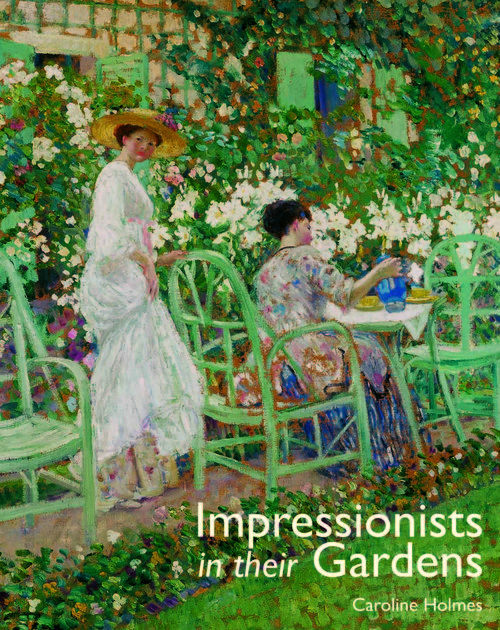 “Impressionists in their Gardens” is published by the Antique Collectors’ Club. Our thanks to the publishers for the use of these beautiful images.